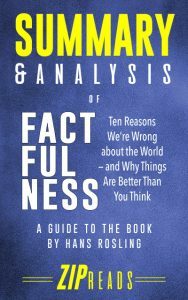 In Factfulness: Ten Reasons We’re Wrong about the World — and Why Things Are Better Than You Think, medical doctor, educator, and statistician Hans Rosling teams up with his son and daughter-in-law to challenge commonly-held notions that the world is worse off than it was in the past. His mission is for everyone to embrace a “fact-based” existence, using “factfulness” to guide every action—from watching the nightly news to solving world hunger. Rosling presents the reader with a simple, fact-based quiz to help determine how skewed your world view may be. The responses to this quiz, he soon reveals, show that the majority of people in wealthy countries all over the world believe the rest of the world is worse off than they actually are. This “overdramatic worldview” is what he so vehemently argues against. He shows that extreme poverty has been slashed, access to healthcare and education is widely increasing, and that mortality rates have fallen precipitously. Rosling provides endless troves of data (more than 20 percent of the original text consists of notes and references) along with personal anecdotes to make his case. The book is well-organized into ten simple “mega misconceptions” that inform our drastically misinformed beliefs. With each of these misconceptions, he clearly lays out how it affects our perceptions of reality and how we can counter it in our daily lives. The ten misconceptions are: gap, negativity, straight line, fear, size, generalization, destiny, single, blame, and urgency. Rosling begs the reader to fight these instincts and use the power of data to inform decisions, to look beyond the doom and gloom of the news, and to see the world for what it is: an objectively better place than it has ever been before.